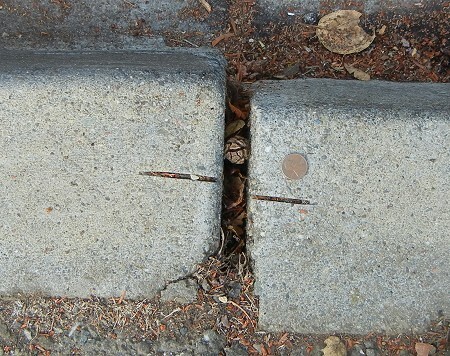 2-1/2 years ago, I presented a photo of a cut mark in the curb of 39th Avenue where the Hayward fault is mapped. This month I happened to visit the spot during an Oakland Urban Pathways walk, and I took the opportunity to take a new photo. It has moved slightly, just a few millimeters, in the intervening time. The authors note that Oakland has a relatively slow rate of creep, and they interpret that as a sign that the fault here is more extensively locked than it is elsewhere. The area and degree of locking bears directly on the energy the fault is capable of releasing. Mind you, we have over a decade of new data and new thinking since that paper was published, but the data is sound. This entry was posted on 27 November 2013 at 5:06 pm and is filed under The Hayward fault. You can follow any responses to this entry through the RSS 2.0 feed. You can skip to the end and leave a response. Pinging is currently not allowed.